A number of cities, counties, states and countries throughout the world have taken steps to either restrict or ban glyphosate, the active ingredient in Monsanto’s Roundup weed killer. Argentina: In 2015, more than 30,000 health care professionals advocated for a glyphosate ban following the International Agency for Research on Cancer’s (IARC) report on glyphosate, which concluded the chemical is probably carcinogenic to humans. More than 400 towns and cities in Argentina have passed measures restricting glyphosate use. Brazil: In August of 2018, a federal judge in Brasilia ruled that new products containing glyphosate could not be registered in the country. Existing regulations concerning glyphosate were also suspended, pending a reevaluation of toxicological data by Anvisa, the country’s health agency. In September of 2018, a Brazilian court overturned the federal judge’s ruling. September marks Brazil’s first month of soybean planting. The country is the largest exporter of soybeans in the world, and as such, has become heavily reliant on agrochemicals. Anvisa issued a statement following the court’s decision to overturn the ruling, saying it will take necessary legal and technical steps in response. Further, Brazil’s Solicitor General’s office has said it is preparing an appeal to the court decision with support from the Agriculture Ministry. Brazil’s health agency concluded a re-evaluation of glyphosate in February of 2019. Based on the agency’s findings, a blanket ban of glyphosate in Brazil is unlikely. Colombia: In 2015, Colombia outlawed the use of glyphosate to destroy illegal plantations of coca, the raw ingredient for cocaine, out of concern that glyphosate causes cancer. In March of 2019, President Ivan Duque asked for the judicial ban on aerial glyphosate spraying to be lifted. El Salvador: In 2013, the country adapted a law banning glyphosate over links to deadly kidney disease. However, by 2016, the legislation appeared to stall. Italy: Italy’s Ministry of Health placed a number of restrictions on glyphosate use. Italian legislators have also raised concerns about glyphosate safety, and have come out against relicensing the herbicide in the European Union. In 2016, the Italian government banned the use of glyphosate as a pre-harvest treatment and placed restrictions on glyphosate use in areas frequented by the public. In November of 2017, Italy was one of seven EU nations to vote against relicensing glyphosate. Portugal: Prohibits the use of glyphosate in all public spaces. The president of the Portuguese Medical Association has also called for a worldwide ban of glyphosate. Switzerland: Concerned about public wellbeing, the Swiss supermarket chains Migros and Coop removed glyphosate-based products from their shelves due to health risks. In 2017, the Green party put forth a plan to ban glyphosate in Switzerland. The proposed plan was rejected by the Federal Council, Switzerland’s executive. United Kingdom: Following the landmark $289 million Monsanto Roundup verdict on Aug. 10, 2018, Homebase, one of the UK’s largest DIY retailers, announced that it would review the sale of Roundup and Ranger Pro. A number of townships, including Brighton, Frensham, Hammersmith & Fulham, Bristol, Glastonbury, Frome, North Somerset, Trafford, Lewes and Wadebridge have also voted to institute restrictions on pesticides and herbicides, including glyphosate. The London Borough of Croydon announced at the end of 2018 that it will stop using glyphosate for grounds maintenance. In March of 2019, Derry City in Northern Ireland issued an order to cease using glyphosate. According to the report, the cancers most associated with glyphosate exposure were found to be non-Hodgkin lymphoma and other hematopoietic cancers. The report further concluded that glyphosate exposure caused DNA and chromosomal damage in human cells, as well as genotoxic, hormonal and enzymatic effects in mammals. Is Glyphosate Banned in Europe? As you can see above, some individual countries have introduced legislation to ban or restrict private sales of glyphosate, or restrictions on spraying glyphosate in public spaces. As for the whole of the European Union (EU), glyphosate is not currently banned. However, EU public opinion is leaning in favor of a glyphosate ban. In a 2016 poll of the five largest EU countries, over 66 percent of respondents said they favored a glyphosate ban. Over 1.3 million people signed a petition in 2017 calling for a European ban of glyphosate. That public pressure caught the attention numerous Members of European Parliament, who have cited the petition as the foundation for instituting an EU ban. In November of 2017, EU member states narrowly voted to relicense glyphosate for a period of five years. The vote was not without controversy; German Agriculture Minister Christian Schmidt (CSU) entered a ‘yes’ vote for his country without consulting with German Chancellor Angela Merkel (CDU) on the matter. His unilateral vote disregarded Germany’s Environment Minister, who had instructed Schmidt to abstain from voting. With Germany’s vote, the measure narrowly passed and glyphosate received a new license. Following the scandal, six EU countries sent a letter to the European Commission, calling for an exit plan for glyphosate. France and Italy have stated they will carry out glyphosate bans by 2020, and Germany announced in 2018 that it will also issue a glyphosate ban. In January of 2019, a European Parliament report found that EU regulators based their decision to relicense glyphosate on an assessment that was plagiarized from a coalition of pesticide companies, including Monsanto. The EU Parliament report investigated claims that Germany’s Federal Institute for Risk Assessment (BfR) copied and pasted large sections of a pesticide industry assessment of glyphosate literature in its own assessment. The BfR report concluded that classifying glyphosate as a carcinogen is not warranted. The European Food Safety Authority (EFSA), which relied upon the BfR report, also found that glyphosate is safe for humans and the environment. Following the release of the EU Parliament report, an EU court ruled that EFSA should publicize glyphosate studies used for its assessments. Is Glyphosate Banned in the United States? Despite the IARC report’s 2015 conclusion that glyphosate is a probable human carcinogen, the U.S. Environmental Protection Agency (EPA) maintains that glyphosate is not likely to be carcinogenic to humans. As such, glyphosate is not banned by the U.S. government; Roundup and other glyphosate-based herbicides are readily available for purchase throughout the country. However, not everyone agrees with the EPA’s conclusion on glyphosate. A number of cities, counties and even one U.S. state have issued bans, restrictions or warnings on glyphosate as a result of the ongoing health concerns. Is Glyphosate Banned in California? California has not issued a statewide ban on glyphosate. However, on July 7, 2017, California became the first state in the nation to issue a warning on glyphosate by adding the chemical to the state’s Proposition 65 list of chemicals and substances known to cause cancer. California’s decision to warn consumers about glyphosate was pursuant to the requirements of the Safe Drinking Water and Toxic Enforcement Act, better known as California Proposition 65, a ballot initiative approved by voters in 1986 to address toxic chemical exposure concerns. Prop 65 requires California to publish a list of chemicals known to cause cancer, birth defects or other reproductive harm. Tucson, Arizona – Created an organics-first policy for controlling weeds on city property. Arcata, California – Initiated a pesticide reduction plan that urges pesticides to only be used as a last resort. Belvedere, California – Passed municipal ordinance initiating Integrated Pest Management program that restricts toxic pesticide use and urges pesticide use as last resort. Benicia, California – City decided to go glyphosate-free following the verdict in Johnson v. Monsanto Co.
Berkeley, California – Implemented pest management program to minimize or eliminate the use of pesticides. Burbank, California – City Council members voted to discontinue the use of Roundup in city parks for one year, and Burbank Unified School District will no longer use the herbicide due to cancer concerns. Carlsbad, California – The City Council voted unanimously to adopt a policy that makes organic pesticides the preferred method for killing weeds. “Asked to choose between aesthetics and public health…I’m going to choose public health every time,” said Councilwoman Cori Schumacher. Corte Madera, California – Passed ordinance calling for Integrated Pest Management (IPM) program restricting highly toxic pesticides, while also urging for pesticide use to be a last resort. Davis, California – Passed ordinance implementing Integrated Pest Management (IPM) program designed to reduce the use of pesticides. Some city parks do not allow the use of glyphosate. Encinitas, California – Banned the use of Roundup and other glyphosate-based weed killers in city parks. Fairfax, California – Passed municipal ordinance restricting use of toxic pesticides on public property in favor of alternative methods. Fresno, California – After hearing from concerned parents and employees, Fresno Unified School District is investigating the use of alternative herbicides that do not contain glyphosate, citing health risks. Irvine, California – City Council passed resolution to cease spraying Roundup and other chemicals on public parks, streets and playgrounds. Laguna Hills, California – Passed a resolution to test an organics-only pesticide program on two parks. Lodi, California –The city decided to ban the use of Roundup within 25 feet of playgrounds. Long Beach, California – Citing the landmark $289 million verdict in Johnson v. Monsanto Co., Long Beach Parks & Recreation Director Gerardo Mouet announced an immediate halt on the spraying of Roundup in Long Beach Parks. Los Angeles County, California – The Los Angeles County Board of Supervisors issued a moratorium on glyphosate-based herbicides, including Roundup weed killer. Malibu, California – The city may implement an Earth Friendly Management Policy (EFMP) to avoid the use of pesticides and other chemicals. Marin County, California – The county stopped using glyphosate, the active ingredient in Monsanto’s Roundup weed killer, on all county-maintained parks, landscaping, playgrounds, walkways and parking areas. Napa, California – A policy announced in March of 2019 banned glyphosate use on city property, completing a phase-out campaign that started three years ago. Novato, California – Following the $289 million Monsanto verdict, Novato Mayor Josh Fryday said the city will no longer use Roundup weed killer. Oakland, California – Passed ordinance initiating Integrated Pest Management program that restricts toxic pesticide use and promotes pesticide use as last resort. On Sept. 1, 2018, the city formally halted the use of Roundup. Alameda County is reviewing its chemical spraying practices. Palo Alto, California – Pest management program calls for Integrated Pest Management that restricts pesticide use in favor of less harmful methods. Petaluma, California – City officials are considering a ban on glyphosate for use in public parks. Richmond, California – Issued an ordinance to ban the use of glyphosate for all weed abatement activities conducted by the city. San Anselmo, California – Passed city resolution promoting an Integrated Pest Management program restricting the use of toxic pesticides. The program only allows pesticide use as a last resort. San Francisco, California – Restricts the use of toxic pesticides on public property in favor of alternative, organic methods. San Juan Capistrano, California – Implemented an organics-first policy to control weeds in city parks and open spaces. San Lorenzo Valley, California – The San Lorenzo Valley Water District voted 4-1 for a permanent ban of glyphosate pesticide use by the district. Santa Rosa, California – Banned the use of Roundup at city parks. Sonoma, California – The Sonoma City Council voted to ban the use of glyphosate in all city parks. Thousand Oaks, California – City instituted a ban on glyphosate use on public golf courses. Woodland, California – Woodland Joint Unified School District suspended the use of Roundup on school campuses. Boulder, Colorado – Banned Roundup for use on city parks. Durango, Colorado – Instituted an Organically Managed Lands program to minimize the use of synthetic fertilizers and pesticides. Middletown, Connecticut – Passed ordinance banning toxic pesticides and herbicides on municipally-owned fields, parks and other property. A growing number of Connecticut towns, including Branford, Cheshire, Granby, Essex, Greenwich, Manchester, Oxford, Plainville, Roxbury, Watertown, and Woodbridge have adopted bans or restrictions on glyphosate use. The state also has Public Act 09-56 to eliminate the use pesticides in K-8 schools. The Florida Fish and Wildlife Conservation Commission ceased using aquatic herbicides, glyphosate chief among them, anywhere in state waters, while the agency gathers public input. Miami, Florida – Announced a city-wide ban on glyphosate-based herbicides in February of 2019. Miami Beach, Florida – Passed a resolution banning the use of glyphosate weed killers for landscaping and maintenance work on city-owned property. North Miami, Florida – City Council approved a plan calling for the gradual reduction of pesticide use on city property and a study on alternative pesticides. Stuart, Florida – City commissioners voted to ban glyphosate, calling for an integrated pest control plan that reduces the use of glyphosate with the ultimate goal of eliminating chemicals. In February of 2018, a series of bills moved ahead in the legislature that would regulate pesticides, including Roundup weed killer. Chicago, Illinois – The city stopped spraying glyphosate in public spaces. Evanston, Illinois – Evanston decided to go pesticide-free in 2010. Glyphosate is banned from use on city property, parks and schools. Franklin Park, Illinois – Passed resolution promoting an Integrated Pest Management (IPM) policy that restricts highly toxic pesticides and urges for pesticides to be considered as a last resort. Naperville, Illinois – Created the Sustainable Parks Initiative, which uses organic products and sustainable practices for weed control. Urbana, Illinois – Adopted the Midwest Grows Green natural lawn care initiative to eliminate synthetic lawn pesticides on city parks. Dubuque, Iowa – City instituted a ban on glyphosate use in public parks. Story County, Iowa – Eliminated the use of chemical pesticides in six of its mowed turf areas. Lawrence, Kansas – Implemented Integrated Pest Management (IPM) program designed to reduce pesticide use. Wichita, Kansas – Initiated pilot program that limits or eliminates pesticide use. Dozens of cities and townships in Maine have adopted local ordinances restricting or banning pesticides and herbicides. Portland, Maine – Banned synthetic pesticides in March of 2019. Private property owners may only use organic treatments on lawns and gardens. No pesticides may be used within 75 feet of a water body or wetland. South Portland, Maine – Passed a pesticide plan that discourages property owners from using certain pesticides and herbicides. Greenbelt, Maryland – Adopted Sustainable Land Care policy for public lands calling for limited use of pesticides. Montgomery County, Maryland – County Council voted to ban the use of cosmetic pesticides on private lawns. In December 2018, Montgomery County Parks announced that it would discontinue the use of glyphosate in parks. Takoma Park, Maryland – Placed restriction on cosmetic pesticides for lawn care on public and private property. Chatham, Massachusetts – Passed an order banning glyphosate use in parks, athletic fields, mulch beds and walkways. Eastham, Massachusetts – Local ordinance requires town employees to receive a permit for use of registered pesticides and prohibits the use of highly-toxic pesticides. Marblehead, Massachusetts – Created Organic Pest Management program to phase out pesticides and herbicides. Warwick, Massachusetts – A measure to ban Monsanto’s Roundup passed at a Special Town Meeting. The ban does not allow people to spray glyphosate on any land within the town. Wellesley, Massachusetts – Wellesley banned all pesticides in 2011. Glyphosate is restricted from being sprayed on athletic fields and any city-owned property. The chemical can be used in limited emergency weed control situations. Minneapolis, Minnesota – Commissioners of the Minneapolis Parks and Recreation Board decided to eliminate all glyphosate-based products from being used in neighborhood parks. In October of 2018, the Park Board’s Operations & Environment Committee voted to extend the glyphosate ban to the entire Minneapolis park system. Rochester, Minnesota – The Parks & Recreation Department initiated a pesticide-free pilot project for city parks. Reno, Nevada – The city initiated a pesticide free pilot program. 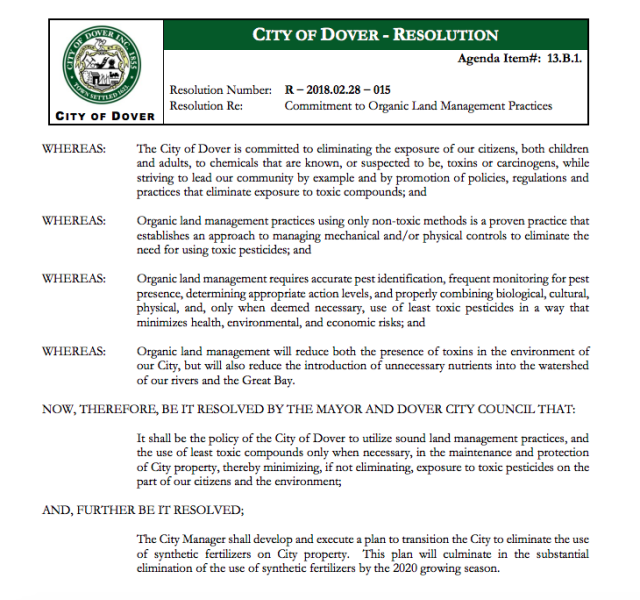 Dover, New Hampshire – Passed resolution calling for Organic Land Management. City utilizes least toxic compounds only when necessary. Portsmouth, New Hampshire – Passed resolution eliminating the use of toxic pesticides on public property in favor of alternative, organic methods. Taos County, New Mexico – Taos County Commissioners are considering the possibility of banning all pesticides, including glyphosate. New Jersey has State and local ordinances encouraging Integrated Pest Management programs to eliminate or drastically reduce the use of pesticides. At least 15 city school districts and over a dozen other parks and recreation departments in the state have enacted IPM programs. In January of 2019, New York State Senator Brad Hoylman (27th District) sponsored a bill in the New York State Senate that would prohibit the sale and distribution of products containing glyphosate. Updates on the legislation can be found here. New York Park and Recreation Department has measures to eliminate or reduce pesticide and herbicide use in areas under its control. New Paltz, New York – The use of toxic pesticides and herbicides by city employees or by private contractors is forbidden on all city-owned lands. Rockland County, New York – Created a Non-Toxic Pesticide program, mandating the use of natural, non-toxic, or as a last resort with prior approval, the least toxic pesticide use. Westchester County, New York – Enacted a law for pesticide-free parks. Carrboro, North Carolina – The city of Carrboro has restricted glyphosate use since 1999. Under the terms of the ban, glyphosate cannot be sprayed in public parks, schools and town buildings or properties. The city will only allow glyphosate to be sprayed under limited circumstances. Cuyahoga County, Ohio – Local ordinance prohibits the use of pesticides on county-owned land, and established the adoption of an Integrated Pest Management program for county-owned properties. South Euclid, Ohio – Passed ordinance prohibiting toxic pesticides on public grounds in favor of alternative, organic pest control methods unless permitted by an Environmental Review Board. Portland, Oregon – Since 1988, Portland has restricted the use of Roundup to emergency use only. Glyphosate is banned on all city-owned property. Austin, Texas – City Council voted to prohibit the spraying of glyphosate on city lands. Multiple bills containing restrictions or bans on glyphosate have been introduced in the legislature. Representative Mari Cordes introduced H. 301, which would ban the sale, use or application of the herbicide glyphosate. Representative Annmarie Christensen introduced H. 328, an act relating to the use of glyphosate herbicide. Charlottesville, Virginia – Restricts the use of glyphosate on any city-owned parks, schools, or buildings. Glyphosate can only be sprayed under limited circumstances. King County, Washington – Passed municipal ordinance initiating an Integrative Pest Management (IPM) program to determine if and how pesticides should be used. Olympia, Washington – City passed a resolution to encourage the implementation of an Integrative Pest Management (IPM) program for non-chemical pest control. Thurston County, Washington –Passed municipal ordinance to restrict the use of toxic pesticides on public property. Do you know of a glyphosate ban not on our list?